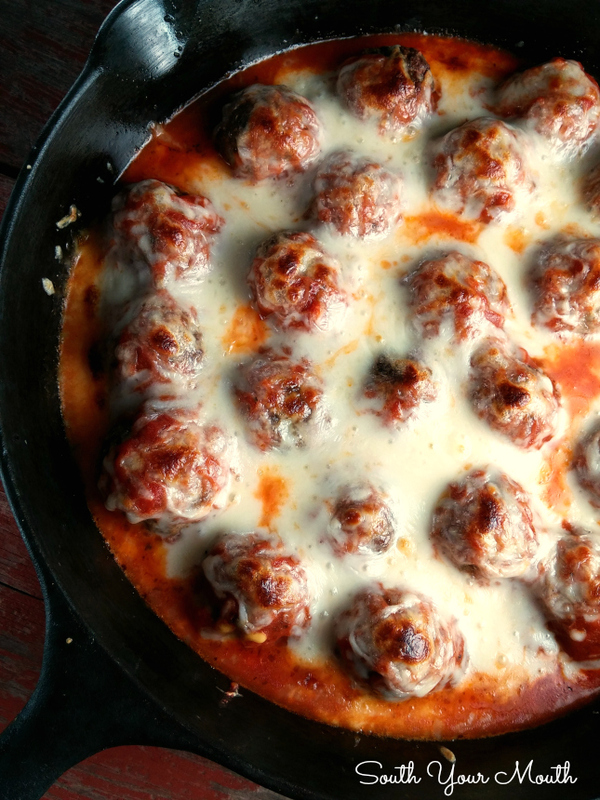 A recipe for Italian meatballs baked in tangy marinara and topped with gobs of buttery, gooey mozzarella. 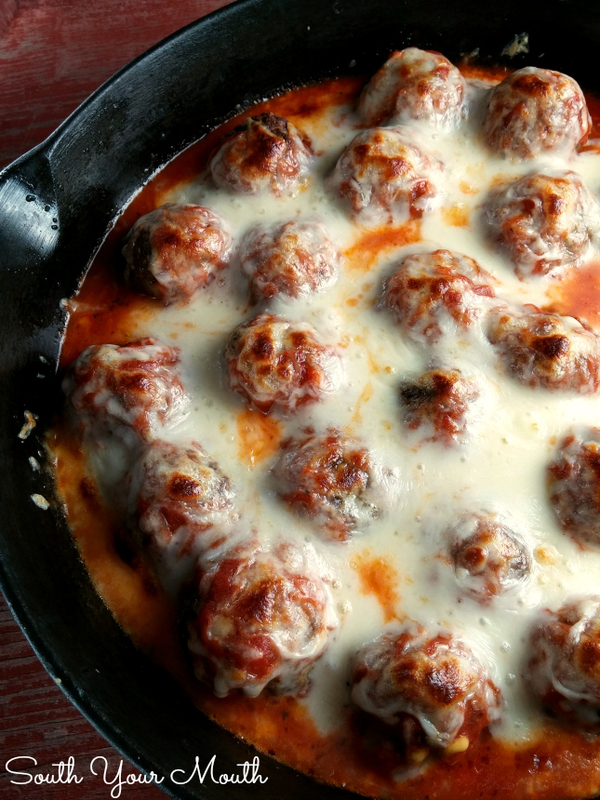 My new favorite meatball meal is this one where the homemade Italian meatballs are baked in tangy marinara and topped with gobs of buttery, gooey mozzarella. I typically serve this with some sort of hearty green vegetable like roasted brussels sprouts, fried zucchini or zucchini noodles and some good crusty bread to soak up all that cheese and sauce. I mentioned this before when I originally published my meatball recipe but I really, really don’t like the supermarket frozen meatballs. I hate the corky texture they have and they’re just so artificial tasting. But they’re convenient. And it’s easy to be lured in to buying them. So, here’s what I do! I make batches of my homemade meatballs, cook them up, plop them in a big o’ gallon-sized zip-top bag and throw them in the freezer. I can quickly make Swedish Meatballs, Crock Pot Meatball Subs, Spaghetti & Meatballs or this beauty any time I want. Having homemade, truly delicious meatballs in your freezer is so incredibly handy AND scrumptious! When we suddenly have people pop over... as is OFTEN the case during baseball season because Husband loves to say awesome things like Hey, everybody can come over to our house after the game if you want! Which isn't as scary as it sounds since A) I love our baseball family and B) I keep stuff like these meatballs stocked up in the icebox! Dump a jar of spaghetti sauce over them then top with cheese and BOOM I've got it covered! Spoon half of the marinara sauce into a large oven-proof frying pan or 13x9 baking dish. Arrange meatballs in pan then cover with remaining sauce. Cook, uncovered, for 10 minutes at 375 degrees or until sauce is heated through. 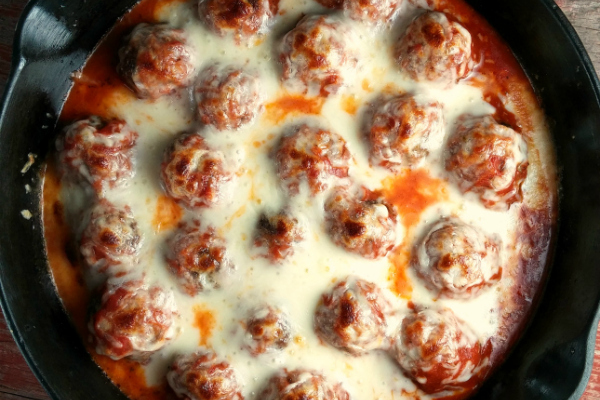 Remove pan from oven and top meatballs with mozzarella. Return to oven and cook for an additional 10 minutes or until cheese is bubbly and starting to brown. Serve with pasta or vegetables such as fried zucchini or roasted brussels sprouts (I love to serve hearty green veggies with marinara sauce – you totally don’t miss the pasta!). In a large bowl combine onion, eggs, worcestershire sauce, parmesan cheese, Italian seasoning, salt, pepper and garlic powder; mix well. Crumble ground beef into mixture and mix with your hands until just combined. Don’t “squeeze” the mixture with your hands – overworking the meat is what yields that “corky” texture. Add bread crumbs and continue to mix the ingredients until everything is just combined and starts to stick together. Add more bread crumbs if necessary until the mixture holds together. Shape into balls by hand or try this trick: Turn mixture out onto a cutting board or clean counter and shape into a rectangle. Pat her down good and keep working on it until it’s perfectly shaped. Using a sharp knife, cut the mixture into 20-24 squares. Roll each square into a ball. This way all the meatballs will be exactly the same size without having eyeball each one. Line a baking sheet with aluminum foil (for easy clean-up) and spray with cooking spray. Place meatballs onto baking sheet and bake at 400 degrees for 18-20 minutes. These sound so good- especially with roasted brussels sprouts! Yes oh Yes! PUUUUULLLLEEEEASE!!! Fabulous recipe. Mouth watering photos. Thanks for sharing with us at Weekend Potluck. This looks delicious! I am going to "pin it" for future use. I am sure my family will love it! I just found your blog. Thanks for sharing! I made this last night and it was a hit!!! 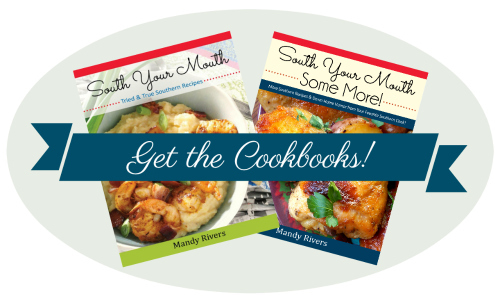 Every recipe I have tried so far from this website has been absolutely wonderful!!! Hi Mandy, nice to meet you. Thanks for the dinner idea tonight. This is my kind of cooking and eating. To get uniformed size meatballs use a clever little gadget called a meatball maker. Looks like scissors with cups on the end.Come in 2 sizes. The smaller one is for making little meatballs for wedding soup. That meatball maker is wonderful. Mine is very old, it was my mom's , it has a hole in the middle of each side of the shaper. Can you freeze these Italian Meatballs? If so, how long can they last in the freezer? I made this for a pizza recipe with egg and spinach for the pizza crust! I can't print this recipe? Hi Mandy. When i visit your site on my mobile device (iphone, safari browser) the site is hijacked and i'm reouted to the candycrush website and to the appstore, and your website completely disappears from my browser. You may need to get your site checked out as the same thing happened on my wife's phone. 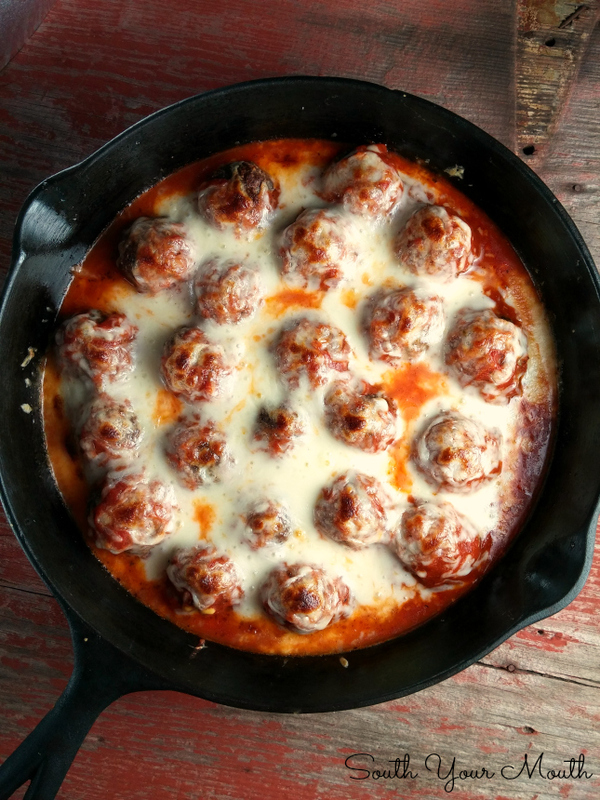 I made these last week for my family for National Meatball Day and they were an immediate favorite!!! I reheated them lunch the next day and they were even better. Definitely give these a shot!! Made these last night and they were the most tender, delicious meatballs....even before going into the sauce. This recipe is a hands down winner! Hubby says "best meatball he has had..." and that is a huge compliment! Even my picky little ones loved them. Yummy! Tonights the night. Using ground pork and ground beef tho....ground venison is in the very near future.